I think we may be done raising Taylor; she’s ready to raise herself now. At least she would think so. Sometimes it is all so clear that she is only four, but other times, I have to remind myself how young she is because she acts so gosh darn old most of the time. She takes showers all by herself. She refuses to let us go into the bathroom with her in public now. This freaks me out in public places, but alas, I do want to encourage her independence. She gets her own drinks and food out of the fridge and pantry. She even eats responsibly. The other night at dinner, she requested more peas and sweet potato fries (which are baked in a wee bit of olive oil, not fried or breaded). And for dessert, she requests frozen yogurt (which is literally tubes of organic, fat free yogurt that is frozen) or popsicles (which is frozen orange juice). This is what she chooses. Occasionally, we have bags of frozen fruit, and that’s a treat!! It’s like little blueberry and raspberry popsicles. She is the best big sister. She and Caleb have really started playing together a lot lately, and she is remarkably patient with him and actually likes having him around. At the playground yestereday, she totally looked out for him and let him follow her around the whole time so I didn’t have to climb the equipment with him as much. She was just great. So mature that one. This change in their sibling relationship occurred after they spent five days separated at different grandparents’ houses while I took a trip and Russ was working crazy resident hours. I guess absence really does make the heart grow fonder. They are becoming good friends, and it warms my heart. 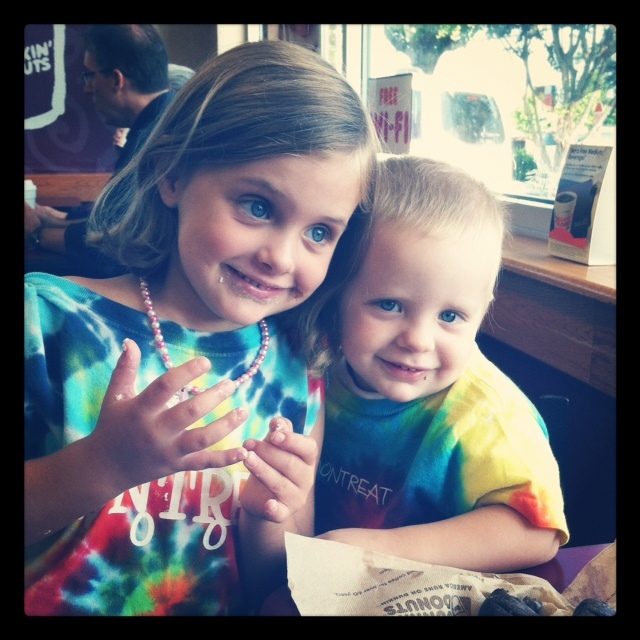 Here they are at our Dunkin Donut’s Tie-Dye Free Donut Friday yesterday morning. Can you even? I love this picture. You must have gotten the blog thing figured out since 2 blogs in 2 days!! Yay!